31st March, marks the 35th anniversary of the disbandment of 50 Squadron RAF, the last Vulcan squadron. With the exception of the Vulcan Display Flight (VDF) that carried on flying a lone Vulcan at air shows until the 1992 season, this was the end of the Vulcan’s operational service after a period of some 28 years since entering RAF service back in 1956. A remarkable career for any aircraft. Here is XH558 as she was last used in RAF service, as an air-to-air refuelling tanker. Photo courtesy of BAES Heritage. Note the 'traffic light' system on either side of the drogue housing. Formed as part of the Royal Flying Corps in May 1916, 50 Squadron operated Sopwith Camels during WW1 and Avro Manchesters and Avro Lancasters during WW2, with Avro Lincolns becoming available to them post war until the Squadron disbanded at RAF Waddington in 1951. 50 Squadron reformed at RAF Binbrook in August 1952 with the new English Electric Canberra jet bomber, before disbanding again in 1959. The technological advancement in aircraft at that time, typified by the new Vulcan design, led to them reforming again at RAF Waddington with Vulcan B.1s in 1961. 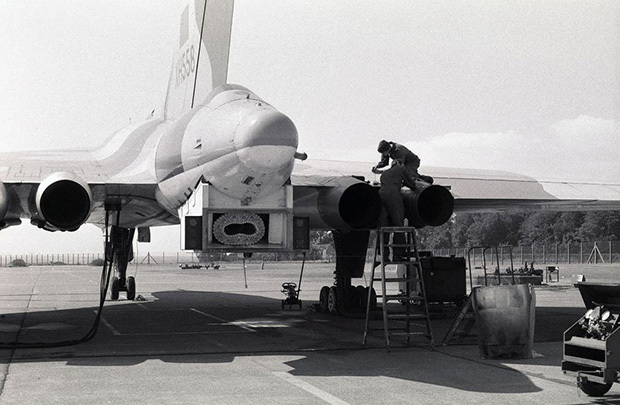 They would move to operate Vulcan B.2’s from 1966 right the way through to the early 1980s, when Vulcan crews and aircraft from the squadron were selected for the Operation Black Buck missions to the Falklands. After the conflict, with the need for increased air-to-air refuelling capacity, and a delay before the newly-acquired VC10s would be available to fulfil this role, it was decided to convert six Vulcan aircraft. This small fleet included XH558. Three other aircraft would remain on charge in the standard configuration to allow continuation training, so nine aircraft remained in service as a programme of disposals and scrapping removed all the others. The arrival of the VC10 tanker operated by 101 Squadron with a larger 3-point tanking capability signalled the end of Vulcan operations and of the squadron. As we now know, of those last nine aircraft, some would find new owners at various museums or were scrapped. XH558 herself remained at Waddington until September 1984, when she was flown to RAF Marham for parts removal ahead of being placed on the fire dump. It was only after examination of paperwork revealed that XH560, the planned replacement aircraft for XL426 on the VDF, had actually less flying hours to the next major service than XH558, that she was then brought back for conversion to B Mk. 2 standards to take up the display role. As structural modifications made in the tanker conversion prevented the refit of ECM equipment to replace the Hose Drum unit, it was decided to leave a single fuel tank in the rear of the bomb-bay in order to bring the center-of-gravity of the aircraft to the correct position. XH560 then made the return trip for scrapping, although the nose section was kept and is now thought to reside in a private collection. The rest, as we say, is now well-written in history! Relive the occasion of that era as XL426 and the Avro Lancaster mark the event in this very rare video footage transferred to YouTube.